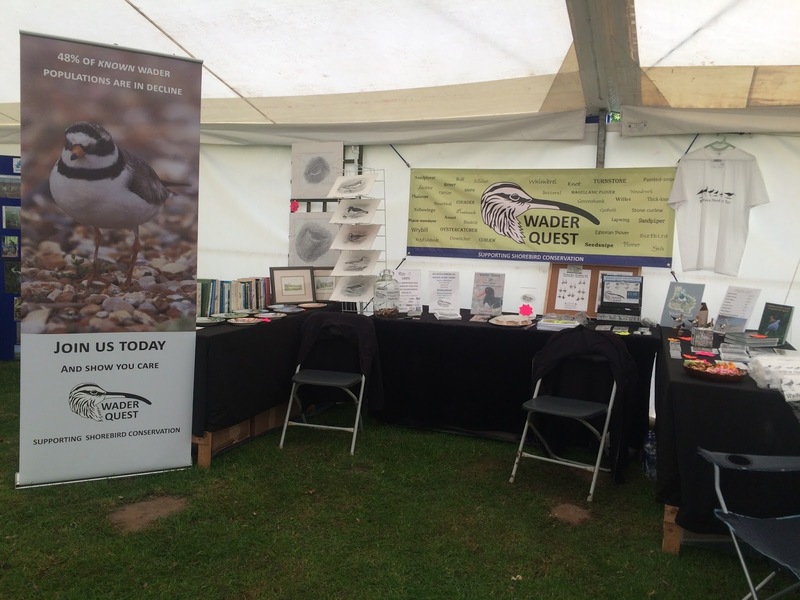 Wader Quest: Norfolk Bird and Wildlife Fair. Time flies when you're having fun! Norfolk Bird and Wildlife Fair. Time flies when you're having fun! Back home after the weekend Norfolk Bird and Wildlife Fair, as usual we had a lot of fun. We had a successful weekend with a few people signing up and some renewing their membership from last year. Saturday was the better of the two days for us with surprisingly high sales with the pins doing very well as usual. We were ably assisted by Trustee Ian Dearing who thoughtfully provided a cake made by his lovely wife 'K' which served as a reward with a free slice for everyone signing up as a Friend of Wader Quest on Saturday. The Wader Quest Norfolk Bird and Wildlife Fair 2016 stand; note the cake under the pink star on the table. On Saturday evening Ian took Elis and me to look for Woodcocks at Holt Lows, we saw three at least as they flew together but we were unsure if further sightings of just two birds were the same birds minus one, or another pair. We were also treated to Nightjars churring , wing flapping and flying around with gay abandon, we also saw one perched as a silhouette against the last vestiges of light in the sky. Dramatic and moving experience after such a long break. Sunday was a little quieter but we had some fun nevertheless. We made the acquaintance in person at last to long standing facebook buddy Gary Prescott, better known to most as the Biking Birder. Sadly we failed to get a photo of this great champion of green birding and his famous bike. He is great fun and we hope we'll see him again soon. Peter who enjoyed a piece of cake, came to the Bird Fair to Sign-up to Wader Quest. Old friends also kept us entertained, Duncan and Pieter on the Wildsounds stand, and alongside them Matt Merritt the Birdwatching Magazine Editor. 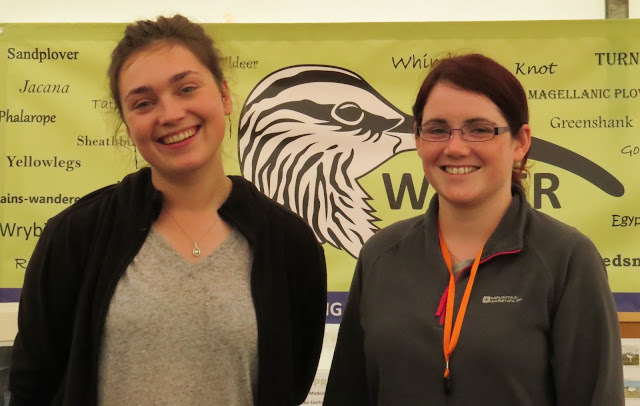 One of our neighbours was the WWT stand with the lovely Emma in charge. we also had visits to the stand by old friend Nik Borrow, Bird Race team mate Dan Bradbury who delivered his fabulous Lapwing picture to us and Chris Galvin of Opticron. New people we had the pleasure to meet included Stu Crutchfield who works with Andrew Whitelee and sculptor Lynn Hazel. The highlight of the day though was the ceremony, following our talk about the Endemic Waders of New Zealand, for the Bird Race cup presentation. David Tomlinson brought along the original trophy for which he and others used to compete. Andrew Whitelee beaming with happiness as David passes on the coveted Bird Race trophy. 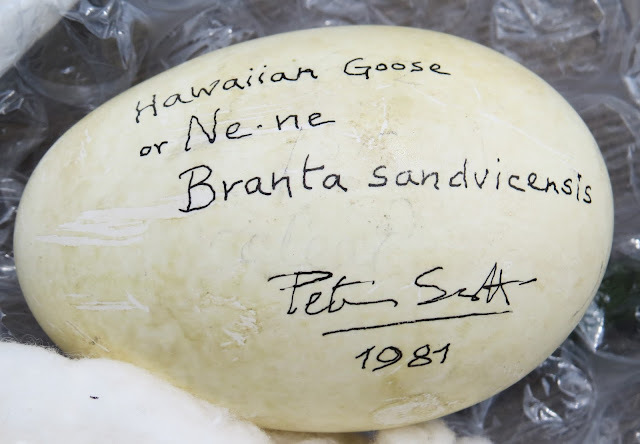 Inside the trophy is a Nene's egg (Hawaiian Goose Branta sandvicensis) that had been signed by Sir Peter Scott himself. The Nene's egg with signature of Sir Peter Scott. 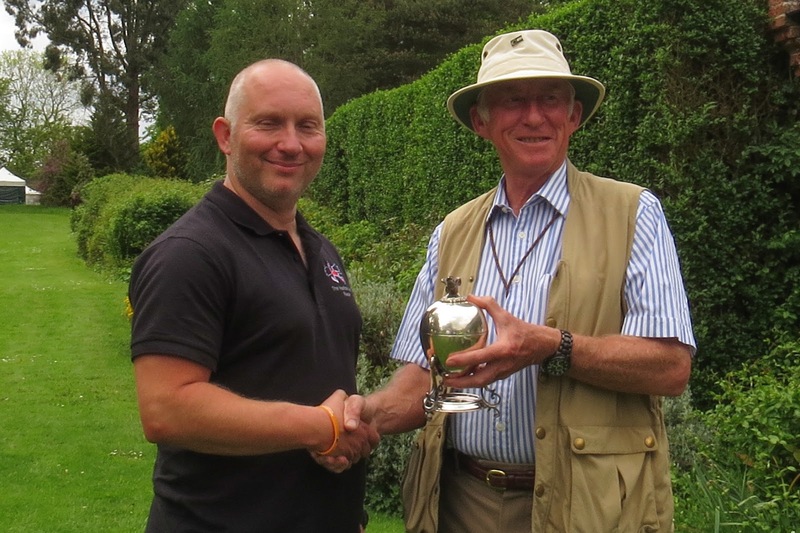 After the cup had been handed to Andrew Whitelee, the Bird Race Organiser, he was all of a quiver handling the trophy and its contents. 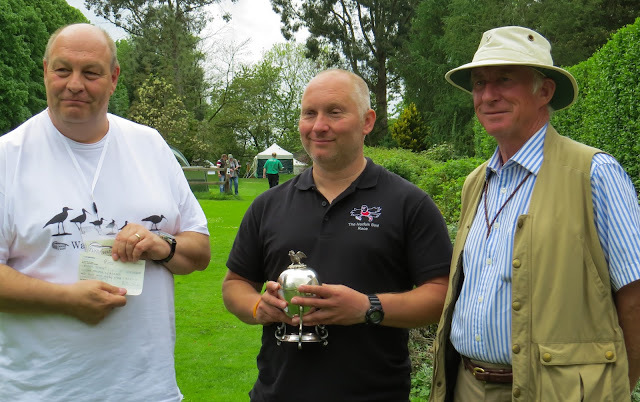 He was able though to produce and present a cheque for £1,664.10 that was raised by the Bird Race for Wader Quest and that is some serious money for a humble organisation such as ours! In order for both Elis and me to attend the ceremony our stand was looked after by Laura Duggan and Amber Hatch who made more sales than we did the rest of the day in one hour! They can come again!! 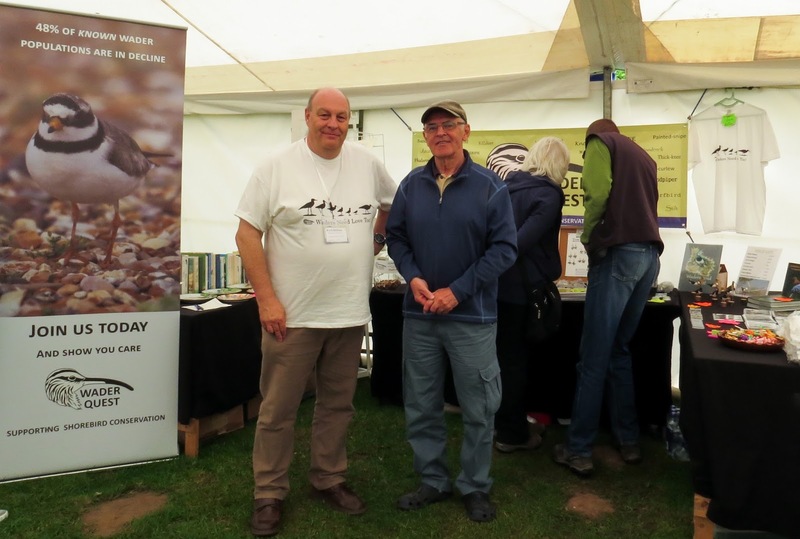 All in all Elis and I love visiting the Norfolk Bird Fair, it is great to see old friends and to relax and we love meeting new folk and talking to them about what we do. We hope that we'll be able to attend again next year and hope that many more people will come along to join in the fun.